Another high quality Brandy de Jerez from Gonzalez Byass. 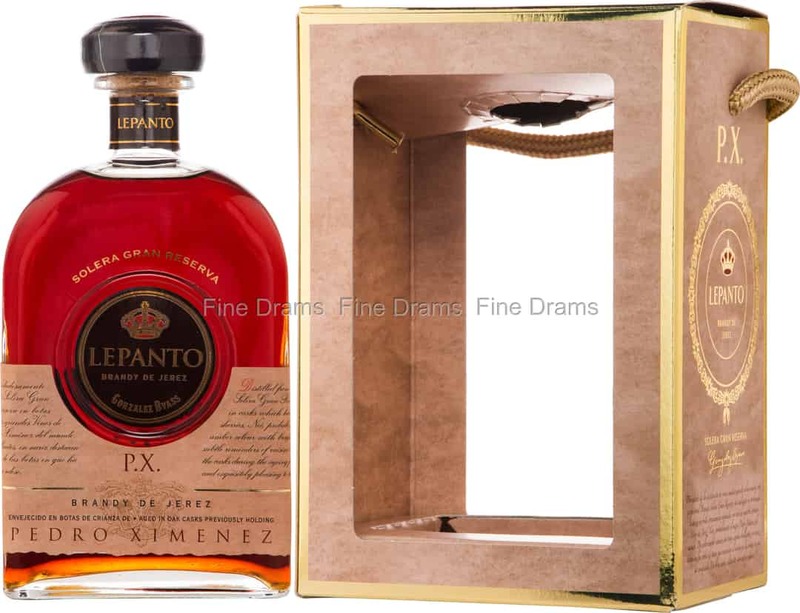 This bottling of Lepanto is made with the same Palomino Fino grapes that make Gonzalez Byass’s world famous Tio Pepe Fino sherry. Palomino Fino are seen as the definitive white grape of Jerez. The grapes are grown entirely on Gonzalez Byass’s estates, located in the Jerez Superior region, the best area in Jerez for the cultivation of the fruit. The brandy is produced using traditional Charentais style stills, often found in Cognac production. After distillation, this brandy has been aged in casks that previously held Pedro Ximénez, the super sweet sherry which features syrupy flavours of dried fruit and spice. This cask maturation has the effect of emphasizing the spirit’s naturally fruity qualities, with the final product serving up notes of bright notes of plums, figs and cherries, with deeper dried fruit flavours, and touches of cinnamon, vanilla, nutmeg and clove. A sophisticated brandy that bursts with fruity flavours, Gonzalez Byass take the same meticulous approach to producing brandy as they do to making fortified wines.